This new Quero Theme is based on the Tango Desktop Theme. Thanks to the Tango team for sharing their work under a Creative Commons license. Are you ready for the new Web experience with less intrusive ads, faster search and easier navigation? Quero Toolbar 4 Final is now ready for you to download. Today is also the third birthday of Quero. Happy birthday, and thanks to everyone who helped evolve Quero by contributing feedback, suggestions, bug reports and donations. Thank you! Important note for all beta users: Due to an internal change you have to respecify the character encoding of all search engines you added or modified in the search profile editor after updating to the final version. If supported by the search engine, Unicode is the recommended choice. The probably longest patent dispute in IT history started back in 1999 when Eolas Inc., a spin-off of the University of California, sued Microsoft for an alleged patent infringement in Internet Explorer. Eolas claims that it invented the idea of embedding external program objects into hypermedia documents or in other words the plug-in technology, which is used in all Web browsers today. After 8 years of legal action Microsoft lost the dispute, although the meaningfullness of such software patents is highly disputed and the plug-in idea is older than the Web, anyway. In April 2006 Microsoft attempted to circumvent Eolas' patent by introducing an unnecessary extra click for external objects, the infamous "Click to activate" prompt. The good news is that Microsoft announced yesterday that it settled the dispute and will remove the ActiveX activation in an upcoming update, scheduled for April 2008. The bad news is that Microsoft is licensing the patent from Eolas under unkown conditions. Opera has already included a similar activation procedure and as Eolas states on their Web site there will be no exception for commercial open-source Web browsers such as Firefox. I am now curious how Mozilla will react on it. I am happy to announce the first public beta of Quero Toolbar 4 today. This major release addresses a top feature request – the customization of the search profiles. While other features such as the ad blocker and IE7 support kept me very busy in the past, I finally managed to work on the new search profile editor and redesign and implement the data structures and algorithms it relies on. Those parts of the code have not been substantially changed since version 1 and have now been completely rewritten. What sets Quero apart from other search toolbars (and browsers) is the possibility to support multi-parametric and HTTP POST queries (I will discuss this feature in a future blog post). Additionally, I kept the concept of organizing your favorite search engines in separate profiles. I have integrated the editor in the Quero options dialog. From there you can add, reorder and edit your search engines. Quero stores your search profiles in the Windows Registry. This beta version is intended for users who like to play with new software. If you have problems with the current version I recommend trying this release as well. Please report any bug you find by going to the About screen and sending me an email from there. Thank you for your support and happy testing! The combination of the search and address bar has turned out to be a very useful and intuitive concept for Web browsing. However, one drawback, which I was already pointed to at the very beginning of the project, was how to navigate quickly to local addresses, i.e. to hosts in your local zone without a "full" domain name. In order to help Quero recognize localhost, for example, as an address and not a search term you have to put http:// in front of it. 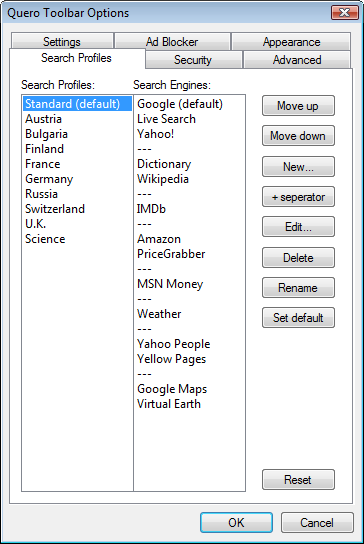 Other solutions are to add the local URL to your Favorites or Links bar or to select it from your auto-complete list from the second time onwards. I am currently testing a more elegant syntax, which will be included in version 4 of the Quero Toolbar. It will be sufficient to append a colon only (localhost:) and optionally one of the two most used port numbers (80, 8080) to any host name in order to start a navigation. While it is possible to specify any port number for localhost, entering movie:300 will still search for reviews for the movie "300" first. In the rare case, where you want to access the Web server movie on port 300, you will still need to add the http scheme. Interestingly, Microsoft has removed the special Internet Explorer desktop icon and the option to turn it on from the "Desktop Icons" dialog. But all is not lost. You can turn it on again by downloading and executing the following Registry file: Turn on IE desktop icon (or turn it off). Refresh your desktop afterwards. If you just discovered Quero I would like to recommend you this comprehensive Quero review from Larry Kuck, Arizona, who introduces the most important features of the toolbar. Read what others say or submit your review here. I have released two new themes for the Quero Toolbar: PitchDark by Tim Banker is optimized for dark desktop themes. If Windows Visual Styles are disabled, you can also set the Windows "3D Objects" color to black (Display Properties > Appearance > Advanced). Red Cats is a sweet theme for feline lovers. Thanks to Tim Banker and Red_Fat_Lazy_Cat for letting me reuse their icons.